You’ve spent thousands of dollars and countless hours interviewing candidates for a role in your company, trying to make sure they will be a good fit and can do the job. The new hire’s success will depend more on how valued you make them feel than the skills they will bring into your company. Replacing an employee can cost between 25-213% of their annual salary. Studies show that 50% of senior hires will fail in the first 18 months, and 50% of hourly workers will last only four months. Having an organized process that helps new employees settle into the company, making them feel welcomed, capable and valued results in significantly higher rates of employee satisfaction and retention. The process of acclimatizing new hires to their new job is called onboarding, and it’s much more than just employee orientation and handing out tax and benefit forms. Onboarding is meant to convey your company’s values and culture, as well as give the employee everything they need to excel in their new role. Ideally, it begins the moment you send them an offer letter. gives them a sense of purpose and belonging. 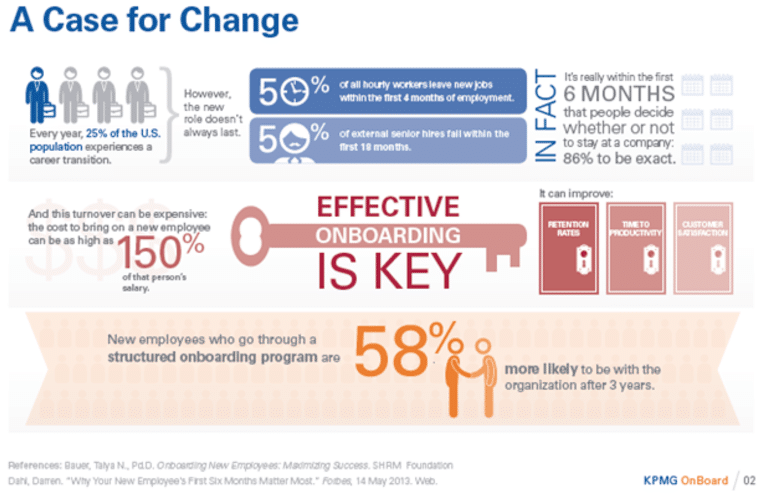 The most successful onboarding programs last between six months to 2 years. This intensive process is meant to build mutual trust and show new hires that you care about their success with your company. They help guide the employee through the often-confusing early days into longer-term retention exercises such as additional training and encouragement toward management or executive streams. But, why should companies care about whether an employee is truly satisfied in their new role? Because losing an employee costs — a lot. Not to mention the long-term damages to a company’s reputation if they are seen as having overly high employee turnover. Losing a low performing employee isn’t often a bad thing, but losing a good employee, particularly when it could have been avoided, means the company has a responsibility to strive for something better. A simple Google search will turn up dozens of different studies that show the costs to replace employees can be varyingly expensive, but all take into account the costs to recruit, interview, hire and train a replacement. As previously mentioned, that cost is believed to be equal to more than 25% of the employee’s annual salary. Though one study by the Center for American Progress found that for senior and executive roles that cost can skyrocket to 213% of their annual salary! However, there are also non-monetary costs to consider, such as decreases to productivity, morale and general job satisfaction for the employees who stay, which can have a trickle-down effect to customer satisfaction. All things considered, designing and implementing an onboarding program seems to make good sense, but does it need to be so intensive, you may ask? The short answer is yes. As the above chart illustrates, failure rates for new hires can be significant. However, employees who underwent structured onboarding program resulted in 58% of them saying they’d likely remain with the organization beyond three years. But just having an onboarding program doesn’t ensure success. In fact, according to an onboarding success survey by the Society for Human Resource Management (SHRM), one-third of new hires quit because they’d undergone little or no onboarding. More specifically, 15% of those respondents said that ineffective onboarding contributed to their decision to leave. Similarly, a different study showed that new hires who reported experiencing poor onboarding were eight times more likely to be disengaged in their work after their first three months. On the flip side, a study by the Aberdeen Group reported that 62% of properly-onboarded employees had higher time-to-productivity ratios. When employees are more satisfied and engaged in their job, it is representative of the deeper emotional investment they have with the company and their role within it. Consulting giant, PWC notes that an engaged employee will go to greater lengths to solve problems and help the organization reach its objectives. A Gallup poll found that companies who have employees who are “very engaged” at work saw 147% higher earnings per share than other companies, which is another great reason to invest in a proper onboarding program. 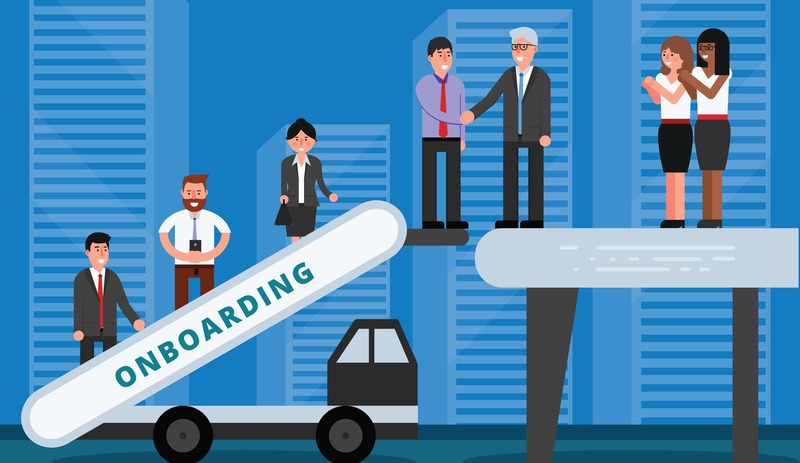 The Aberdeen Group study also showed that 83% of the highest performing organizations began onboarding prior to the new hire’s first day on the job. Often, The first step in a structured onboarding program begins with the company’s employee management software. It is designed to save the company time and resources while almost completely eliminating the chance of important employee requirements from being overlooked. When a company decides to extend an offer to a candidate, HR enters the employee’s title, salary, and start date into their automated system. The details are instantly populated into an offer letter, personalized welcome message, all requisite compliance forms, agreements, benefits package, and handbooks, then emailed to the employee. The new hire can review and digitally sign all forms and agreements through the employer’s online HR portal prior to their first day, eliminating the need for paper copies of the documents, and a first day spent on administrative tasks. HR also uses the automated system to assign and coordinate the workspace set up with other departments such as IT, security, training and supplies so everything is ready for them on their first day. This early attention to detail gives the employee a positive impression of the company and makes them feel valued from the moment they receive the offer letter. Once the new employee starts, onboarding should continue with introductions to team members, managers, and other departments with whom the employee will be working. Along with receiving proper training, social interaction with others in the company is critical for the new hire to feel welcomed and prepared to perform their duties. In some cases, an onboarding coach or mentor is assigned to help the employee successfully navigate through the company. A 2013 study that appeared in the Academy of Management found that support of new employees from coworkers and supervisors tends to decline within the first 90 days and sets the tone for the rest of their work experience. Coworkers and supervisors who were unsupportive or went so far as to undermine the new employee were directly linked to higher rates of turnover. Therefore, existing employees and managers must understand the importance of creating and fostering a genuinely positive company culture, and if necessary, undergo additional training on how to do this. Having employees ‘fit in’ with the existing environment is critical, and online footwear giant, Zappos recognized this when they created their onboarding program. Zappos puts new employees through an intensive five-week training program on the company’s culture and values. If at the end of the course, the new hire doesn’t think they are the right fit for the company, they can take a $2,000 payout and leave. To date, only about 1% of the new hires take the money. For an onboarding program to be successful the entire company has to believe in the process, starting with the most senior executives on down. Your employees should be committed to acting as positive, approachable role models, building a level of trust that will result in a more cohesive work environment. Team members or managers who can’t, or worse, refuse to support the program could be the catalyst for its failure. As well, ensure your messaging is clear across the board. What you tell your new hires about their goals and your expectations should be identical to what you’ve told their managers, so both parties are working toward the same purpose. How long should your onboarding program last, and who will manage it? Who will play a direct role in the program, and how will you ensure their support? What components will your program include? What about your company’s values and culture do you want to share with new employees, and how will you convey the message? Who in the company can, and is willing to, act as a mentor to new hires? What milestones do you want to set for new employees? How, how often, and who will provide the new employee with feedback of their progress? How will you measure/determine the program’s success?